In a recent post I mentioned the work of famed psychologist Jean Piaget. His theories of cognitive development were revolutionary in the way we look at the maturing of our ability to think. While his theories have been proven to be perhaps too rigid in their somewhat linear progression, they remain incredibly insightful. In fact, that we may not “pass through” his phases as readily as he presumed has interesting implications, because when some of the characteristics of his earliest phases subtly persist later into life (and I believe they do in some areas) – they can really effect our choices. 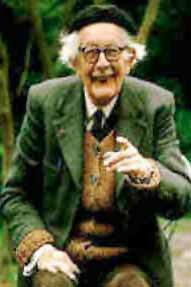 What is not too often discussed about Piaget is that he was trained in natural history and philosophy prior to becoming a psychologist. He studied molluscs. Molluscs are that phylum of creatures that include a wide variety of tasty, colorfully shelled seafood, up to and including the most intelligent invertebrate the Octopus (which are very tastefully prepared on the north shores of Spain). So, anyone insightful enough (Piaget) to study a creature intelligent enough (Paul the Octopus) to have recognized the beauty of play resulting in the recent World Cup dominance of Spanish soccer is ipso facto, brilliant in my book. But I digress. Let’s take a look, albeit simplified to my level of thinking, at what Jean Piaget believed about our cognitive development from the time we are children until we’re adult, and then take a look at how some funny parallels might be drawn to adult behaviors that persist well into our professional careers. Shall we? First let’s quickly outline some key concepts, and provide a reference here to more depth on each of the topics should you need a reference below. In brief, what Piaget believed is that children have what he called schemata, or cognitive formations that encapsulate our constantly changing ideas of the world. These schemata in his view change by what he called adaptation, using the processes of assimilation and accommodation. When new information is presented to the child through the senses, there is an effort to assimilate it into existing schemata, if it doesn’t fit, you must acquit,…er, I mean accomodate by either creating new schemata or modify an existing schemata. This process of fitting, modifying or creating gets balanced to reduce and attempt to minimize psychological tension through a process he termed equilibration. There. Simple, right? There’s more. Piaget also believed there were four distinct phases of development. How he termed them as follows, along with an outline of some of the key characteristics of each. 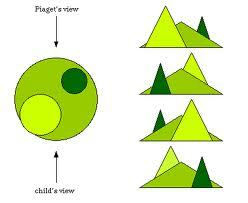 Stage One: Piaget called this the Sensorimotor Stage which is believed to span from birth to approximately 2 years old. It is characterized by a half a dozen sub stages. More simply stated perhaps are the two primary ways the features of this stage present themselves in the child. The first was called Object Permanence. This can be simplified to the old saying, “Out of sight, Out of mind”. In other words, learning to overcome the, if I can’t see it, it doesn’t exist phenomena (like some have with memos or emails containing contradictory evidence than that we wish to see, and may explain some of the whistling past the graveyard type of behavior that accompanies “cooking the books” and such). The second primary trait of this phase is Deferred Imitation. This can be seen when a child scolds a stuffed animal, or drives a toy truck around the floor. What this really means is that they can hold an idea in their minds beyond the immediate experience, so they can pretend (that the financial forecast is not as bad as it appears). Stage Two: Piaget termed this phase, the Pre-Operational Stage. He believed that we progressed through the development of these tools from the ages of 2 – 7 years old. This stage can probably be best simplified to our ability to deal with symbols, and the way we can form relationships between objects, language and our own actions. This is what is going on when a child runs around flapping his arms like a bird, or running around with a Tupperware lid serving as a steering wheel. The interesting characteristics in this stage are called Egocentrism and Conservation. Let’s take Egocentrism first, we here this term a lot. But what it really means in Piaget’s work is developing the cognitive skills and tools to overcome believing that your view of the world is everyone else’s (OK, this one’s just too easy… Do I even need to go into the variety of business, religious, political and other problems that this can and has caused) Piaget demonstrated this beautifully in what was termed the Three Mountain Problem. Simply put, younger kids thought Piaget (or a doll, or anyone with another view) saw what they saw from their vantage point, and older kids knew there was a valid and alternative vantage point. Watch it in action below. 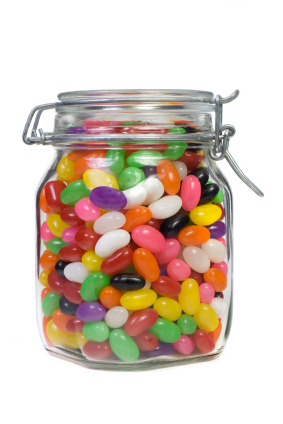 The conservation phenomena observed how when comparing two equal volumes of liquid in two of the same sized containers, the act of changing the container of one of them from a geometry that was short and wide to one that was narrow and tall could change the perception of the volume or amount of liquid, despite that fact that the formerly observed same amount of liquid was transferred in plain sight. The inability to reason that this must be the same amount of liquid is what Piaget termed Conservation (be careful the next time you buy your favorite product that the new and improved version is not lighter, in a larger package at a higher price!). It has other interesting implications in terms of reasoning. For instance there is a famous example in his experiments of asking a young child with an older brother, “Do you have a brother?”, the child will say, Yes. When asked “Does your brother have a brother?”, he often says, No. This is why 7 years old came to be known as the “age of reason”. This ability to turn the problem around to different perspectives and see consistency in seeming different arrangements is key to development in this stage. Two more, let’s look at stage 3. Putting the realities of the situations we face into an “out of sight, out of mind” category, doesn’t make them go away. The issues are in fact still there and must be dealt with directly. Just imitating someone who is in the right while blaming others, after having colluded or been complicit in bad decisions or outright wrong doing oneself, doesn’t make one right. There are perspectives other than one’s own “vantage point” that are both valid, and relevant – it is difficult to argue that “my way or the highway” constitutes adult thinking. We need to be insightful in our comparisons, and on the watch out not to be fooled by similar things presented differently, and vice versa, very different things trying to be made similar. The skills of critical thinking and inference have to be exercised and honed in the information age. We do not always have the luxury of what we see, is what we get, abstract reasoning is vital regarding what is being presented in our media, and various forms of communications. Analytical thinking, systematic process and diligence has to be reinvigorated versus quick trigger decision making. Slowing down to speed up real progress is likely starting to yield better results than uninformed sense of urgency under the guise of being “results oriented”. That’s my take, I hope you enjoyed or find this a beneficial side road on the nature of our thinking and decision making. These are easy things to take for granted regarding the way we formulate our ideas, the way we perceive our worlds and how that impacts our complex choices. Please share your thoughts in the comment section. Until next time.